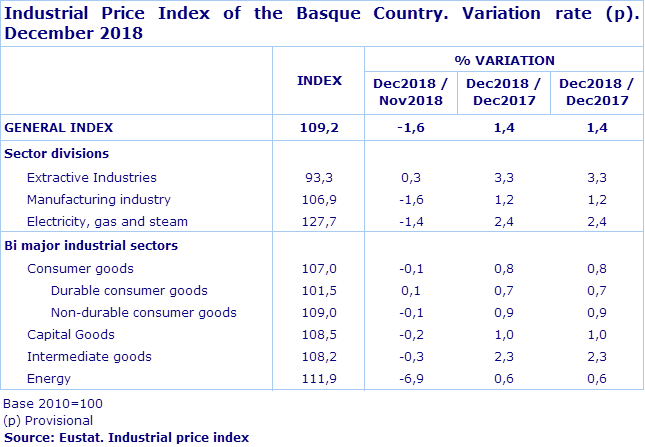 Industrial prices in the Basque Country fell by 1.6% in December 2018 with regards to the previous month, according to EUSTAT data. With these data, the year-on-year rate for December, which indicates the fluctuation in industrial prices over the last twelve months, showed growth to be 1.4%. Industrial prices in 2018 obtained an average positive rate of 3.3%, repeating the average growth registered in 2017. A more detailed sector-level analysis reveals that in December 2018, the most inflationary branches on the previous month were: Timber, Paper & Graphic Arts and Extraction Industries, with growth of 0.3%, in both cases. On the other hand, the following sectors recorded the largest decreases in prices: Coke Plants & Oil Refining, with a decrease of 10.8%, Electricity, Gas, Steam & Air Conditioning, which fell by 1.4%, and Chemical Industry, down 0.7%. Following the classification of Goods by economic destination, with regards to the previous month, Energy posted a 6.9% decrease in prices, Intermediate Goods fell 0.3% and Capital Goods were down 0.2%. Consumer Goods, as a whole, fell by 0.1%. Within these, prices of Consumer Durables were up by 0.1%, whilst in Consumer Non-durables, there was a downturn of 0.1%. In the year-on-year period, December 2018 on December 2017, the greatest increases in prices occurred within the branches of: Chemical Industry, Timber, Paper & Graphic Arts and Textile, Garments, Leather & Footwear, all with an increase of 3.4%. By contrast, decreases in prices were seen in the sectors of: Furniture and Other Manufacturing Industries; Repairs and Installation, down 2.7%; Coke Plants & Oil Refining, with a decrease of 1.5%, and Manufacture of Computer, Electronic & Optical Product, with a drop of 0.5%. The price variation of the large goods groups was positive over the year-on-year period in all cases: Energy grew at a rate of 0.6%, Intermediate Goods by 2.3%, Capital Goods by 1.0% and Consumer Goods by 0.8%. Amongst the latter, the prices of Consumer Durables rose by 0.7%, and Consumer Non-Durables were up by 0.9%.